Taste test: These crispy potato chips were thin, crunchy and light in color. Depending on the chip, there was either a light or heavy coating of orange cheese powder. 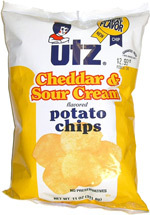 Utz did a good job creating a chip where you can not only taste the cheddar cheese, but also the sour cream and the potato in the chip (even on the lightly coated ones). 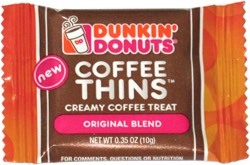 It's a good thing these are sold in a big bag, because if you're like me, you'll end up eating a lot of these in a sitting, and you'll also want to share them with friends. A small amount of orange powder did end up on my fingers. Smell test: There is an aroma, but I can't figure out what it smells like. It sort of smells like cheese.